I”m baaaaccckkkk!! Yes I know I have been away for far too long but let me tell you it has been a crazy month, traveling and training, traveling again and more training! 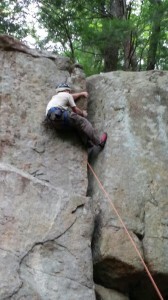 But, more on that later, many people have asked “how do I prepare or practice climbing and entering skills in a modern manner”, well my answer is Rock climbing and rappelling! Two weeks ago I had the great opportunity to teach these skills to a local Scout troop and as you can see this climb involved a pretty good technical knowledge and the ability to face fear and do it anyway! So as a lesson for you, what modern practices are you using or bringing into you current ninjutsu practice? Be ready alot more posts and information coming your way!